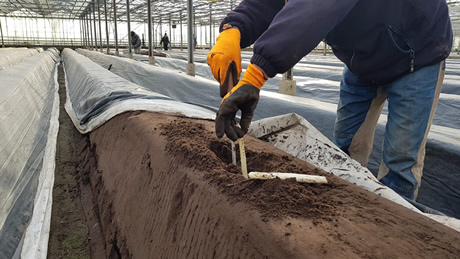 Yesterday, The Greenery auctioned off their first Dutch greenhouse-grown asparagus. The buyer - P. Smets. The price for this first box with a yield of 5kg was €6.000. Pierre Smets paid € 3.000 and The Greenery then doubled the amount to € 6.000. Together with the buyer, they donated these proceeds to Kinderen Kanker Vrij (KiKa). KiKa is a Dutch charity foundation that raises funds solely for research into childhood cancers. 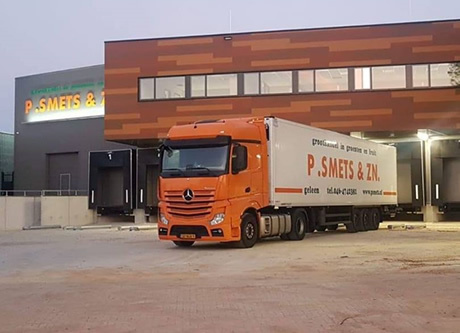 P. Smets has been a wholesaler in the Dutch town of Geleen since 1930. With Pierre Smets, this family's second generation is still fully active in the company. Son, Loek, handles shipping, sales, and logistics. Another son, Richard, is responsible for logistics and sales. Other wholesalers have fallen by the wayside over the years. However, in that time, Smets has only expanded its position. "We are at the ready for our clients, literally, almost day and night. There are many reasons for our success. This can be seen in the intricate distribution our company provides", says Loek. "We take this very far. Our clients have their products delivered when and where they want them. This might be at various places for people who are selling at market and that do not have cooling facilities. It may be more cost-effective for one client if we deliver ten boxes of newly-auctioned merchandise every day. Rather than them driving to the trade site themselves to collect a pallet, which they then store for a week." Last Wednesday, the very first batch of asparagus was supplied by Ron Martens. Ron is an asparagus farmer for The Greenery from Tienray in the province of Limburg. Ron sees it as a challenge to be able to harvest asparagus as early in the year as possible. He wants asparagus lovers to be able to enjoy this 'white gold'. It is, however, rare for asparagus to be harvested this early. The asparagus are of excellent taste and quality. Production will gradually increase in the coming weeks. The Greenery has grown into a chain partner in the cultivation and marketing of high-quality Dutch asparagus. Daily, this company's growers and employees ensure that the product finds its way as smoothly as possible to clients. The asparagus are sent in the required packaging, peeled or not, to wholesalers, supermarket chains, caterers, and companies in the processing industry all over the world. The asparagus is transported in refrigerated trucks at night. They come from the farmer to The Greenery's Distribution Center (DC) in Breda. By 09:00 in the morning, they are sold. The DC in Breda is fully equipped for the packaging and processing of asparagus. Sjraar Hulsman manages the asparagus product group. 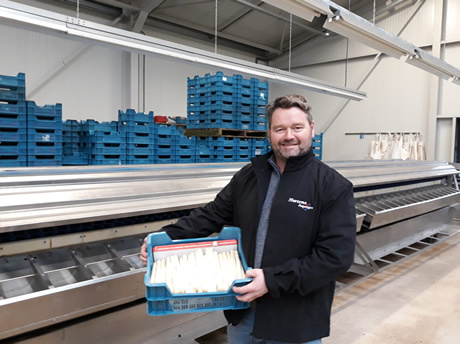 He says, "The fact that Pierre bought the first box of Dutch asparagus, underlines the confidence Smets has in our growers and us as the market leader in this product." "Locally, we have seen that our Dutch premier asapragus has just about forced the Peruvian asparagus out of the market. Our asparagus is grown in greenhouses and heated tunnels. Our product is very different when it comes to appearance, taste, and freshness. This difference leads Dutch consumers to be willing to pay that little bit extra." "We have also noticed that Dutch premier asparagus are slowly gaining ground in the overseas specialist (hospitality) market. These clients are from countries such as Germany, France, and Japan", concludes Hulsman.